Washing a load of laundry can sometime come with hidden toxic chemicals, from harsh detergent to petroleum based fabric softener. You may have seen little plastic dryer balls on the market but they are made from PVC and can off-gas yucky stuff. Commercial dryer sheets coat your clothes in toxic lab created fragrances. Remember that your clothes lay against your skin all day! I came across wool dryers while questioning the safety of all these commercial laundry products. Woolzies wool dryer balls are by far some of the best quality dryer balls on the market. I love the ease of nonstick pans but I am not a big fan of Teflon. When I found out how dangerous Teflon was, I tried all sorts of different pans including; cast iron and stainless steel. Food was constantly sticking and they were a pain to clean. So, I ventured back to nonstick and found some great non-toxic pans. 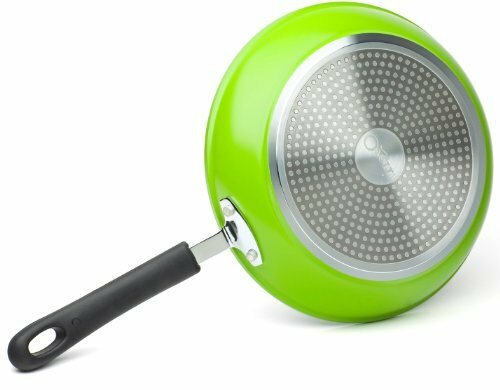 I have had the opportunity to try this 10" Ozeri® Green Earth Textured Ceramic Nonstick Frying Pan and I am very pleased.